Events from the year 1939 in Canada. May 17 - George VI and Queen Elizabeth begin their royal tour of Canada, eventually visiting every province. September 7 - Prime Minister Mackenzie King calls for a special session of Parliament, to discuss a declaration of war versus Nazi Germany. The session lasts until September 13. September 11 - World War II: Canada establishes a High Commission of Canada in Canberra, Australia. Australia reciprocates, the next day. September 28 - World War II: Air training facilities are set up in Canada to train pilots from Britain and the rest of the Commonwealth. 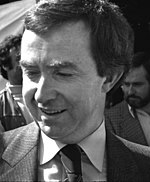 October 25 - The Quebec election is won by the Liberals under Joseph-Adélard Godbout. December 17 - World War II: The 1st Canadian Infantry Division lands in Scotland en route to England. The division is accompanied by a team of announcers and technicians, who set up Radio Canada's overseas service. Canada rapidly expands its international presence by establishing High Commissions in Australia, Ireland, New Zealand and South Africa. April 16 - Boston Bruins won their Second Stanley Cup (and last until 1970) by defeating the Toronto Maple Leafs 4 games to 1. April 17 - Ontario Hockey Association's Oshawa Generals won their First Memorial Cup by defeating the Edmonton Junior Hockey League's Edmonton Athletic Club Roamers 3 games to 1. The deciding Game 4 was played at Maple Leaf Gardens in Toronto. December 9 - Winnipeg Blue Bombers win their Second Grey Cup by defeating the Ottawa Rough Riders 8 to 7 in the 27th Grey Cup played in Lansdowne Park in Ottawa. ^ "House of Commons Procedure and Practice - 8. The Parliamentary Cycle - Opening a Parliament and a Session". Parliament of Canada. Retrieved 2011-09-15. ^ "Australia-Canada relations" (PDF). Foreign Affairs and International Trade Canada. Retrieved 2011-02-13. Wikimedia Commons has media related to 1939 in Canada. This page was last edited on 13 January 2019, at 01:18 (UTC).